Terminal High Altitude Area Defense (THAAD), formerly Theater High Altitude Area Defense, is an American anti-ballistic missile defense system designed to shoot down short-, medium-, and intermediate-range ballistic missiles in their terminal phase (descent or reentry) by intercepting with a hit-to-kill approach. THAAD was developed after the experience of Iraq's Scud missile attacks during the Gulf War in 1991. The THAAD interceptor carries no warhead, but relies on its kinetic energy of impact to destroy the incoming missile. A kinetic energy hit minimizes the risk of exploding conventional-warhead ballistic missiles, and the warhead of nuclear-tipped ballistic missiles will not detonate upon a kinetic-energy hit. Originally a United States Army program, THAAD has come under the umbrella of the Missile Defense Agency. The Navy has a similar program, the sea-based Aegis Ballistic Missile Defense System, which also has a land component ("Aegis ashore"). THAAD was originally scheduled for deployment in 2012, but initial deployment took place in May 2008. THAAD has been deployed in Guam, the United Arab Emirates, Israel, and South Korea. The vulnerability and lethality analyses of the THAAD have been conducted by the U.S. Army Research Laboratory (ARL). The vulnerability assessment for the THAAD featured an evaluation of the effects of major electromagnetic elements. This included EM interference, EM radiation operations, EM radiation hazards, EM pulse, electrostatic discharge, and lightning effects on components of the THAAD system. The ARL assessments were designed to determine the THAAD system's growth potential given its tactical design as well as provide survivability analysis against threats such as conventional weapons, chemical weapons, and electronic warfare countermeasures. The data collected from the analyses were used to develop trajectory models for targets and missile as well as target trajectories using infrared scene generation of infrared countermeasures (IRCMs). The THAAD system is being designed, built, and integrated by Lockheed Martin Missiles and Fire Control acting as prime contractor. Key subcontractors include Raytheon, Boeing, Aerojet Rocketdyne, Honeywell, BAE Systems, Oshkosh Defense, and MiltonCAT. The THAAD missile defense concept was proposed in 1987, with a formal request for proposals submitted to industry in 1991. The THAAD program benefited from results of previous missile defense efforts like High Endoatmospheric Defense Interceptor (HEDI) and the Kinetic Kill Vehicle Integrated Technology Experiment (KITE). In September 1992, the US Army selected Lockheed (now Lockheed Martin) as prime contractor for THAAD development. Prior to development of a physical prototype, the Aero-Optical Effect (AOE) software code was developed to validate the intended operational profile of Lockheed's proposed design. The first THAAD flight test occurred in April 1995, with all flight tests in the demonstration-validation (DEM-VAL) program phase occurring at White Sands Missile Range. The first six intercept attempts missed the target (Flights 4–9). The first successful intercepts were conducted on 10 June 1999 and 2 August 1999, against Hera missiles. 21 April 1995 Success First test flight to prove the propulsion system. There was no target in the test. 31 July 1995 Aborted Kill vehicle control test. The test flight was aborted. There was no target in the test. 13 October 1995 Success Launched to test its target-seeking system. There was no attempt to hit the target in the test. 13 December 1995 Failure Failed to hit a test target due to software errors in the missile's fuel system. 22 March 1996 Failure Failed to hit a test target due to mechanical problems with the kill vehicle's booster separation. 15 July 1996 Failure Failed to hit a test target due to a malfunction in the targeting system. 6 March 1997 Failure Failed to hit a test target due to a contamination in the electrical system. 12 May 1998 Failure Failed to hit a test target due to an electrical short circuit in the booster system. At this point, the U.S. Congress reduced funding for the project due to repeated failures. 29 March 1999 Failure Failed to hit a test target due to multiple failures, including guidance system. 10 June 1999 Success Hit a test target in a simplified test scenario. 2 August 1999 Success Hit a test target outside the atmosphere. In June 2000, Lockheed won the Engineering and Manufacturing Development (EMD) contract to turn the design into a mobile tactical army fire unit. Flight tests of this system resumed with missile characterization and full system tests in 2006 at White Sands Missile Range, then moved to the Pacific Missile Range Facility. The Interceptor was led through development and initial production by Tory Bruno, who later became CEO of United Launch Alliance. 22 November 2005 Success Launched a missile in its first Flight EMD Test, known as FLT-01. The test was deemed a success by Lockheed and the Pentagon. 11 May 2006 Success FLT-02, the first developmental flight test to test the entire system, including interceptor, launcher, radar, and fire control system. 12 July 2006 Success FLT-03. Intercepted a live target missile. 13 September 2006 Aborted Hera target missile launched, but had to be terminated in mid-flight before the launch of the FLT-04 missile. This has officially been characterized as a "no test". Fall 2006 Cancelled FLT-05, a missile-only test, was postponed until mid-spring 2007. 27 January 2007 Success FLT-06. Intercepted a "high endo-atmospheric" (just inside Earth's atmosphere) unitary (non-separating) target representing a "SCUD"-type ballistic missile launched from a mobile platform off Kauai in the Pacific Ocean. 6 April 2007 Success FLT-07 test. Intercepted a "mid endo-atmospheric" unitary target missile off Kauai in the Pacific Ocean. It successfully tested THAAD's interoperability with other elements of the MDS system. 27 October 2007 Success Conducted a successful exo-atmospheric test at the Pacific Missile Range Facility (PMRF) off Kauai, Hawaii. The flight test demonstrated the system's ability to detect, track and intercept an incoming unitary target above the Earth's atmosphere. The missile was hot-condition tested to prove its ability to operate in extreme environments. 27 June 2008 Success Downed a missile launched from a C-17 Globemaster III. 17 September 2008 Aborted Target missile failed shortly after launch, so neither interceptor was launched. Officially a "no test". 17 March 2009 Success A repeat of the September flight test. This time it was a success. 11 December 2009 Aborted FLT-11: The Hera target missile failed to ignite after air deployment, and the interceptor was not launched. Officially a "no test". 29 June 2010 Success FLT-14: Conducted a successful endo-atmospheric intercept of unitary target at lowest altitude to date. Afterward, exercised Simulation-Over-Live-Driver (SOLD) system to inject multiple simulated targets into the THAAD radar to test system's ability to engage a mass raid of enemy ballistic missiles. 5 October 2011 Success FLT-12: Conducted a successful endo-atmospheric intercept of two targets with two interceptors. 24 October 2012 Success FTI-01 (Flight Test Integrated 01): test of the integration of THAAD with PAC-3 and Aegis against a raid of 5 missiles of different types. During this engagement THAAD successfully intercepted an Extended Long Range Air Launch Target (E-LRALT) missile dropped from a C-17 north of Wake Island. This marked the first time THAAD had intercepted a Medium Range Ballistic Missile (MRBM). Two AN/TPY-2 were used in the $180M test, with the forward-based radar feeding data into Aegis and Patriot systems as well as THAAD. 11 July 2017 Success FTT-18 (Flight Test THAAD 18): The FTT-18 test plan was announced to the public on 8 July 2017. The first test of THAAD against an IRBM, FTT-18 successfully occurred on 11 July 2017; an Alaska-based THAAD interceptor, launched from the Pacific Spaceport Complex – Alaska on Kodiak island, intercepted its target over Alaska airspace. The FTT-18 target simulated an intermediate-range ballistic missile. It was "launched" near Hawaii from the cargo hold of a C-17, being initially dropped by parachute. From there the mock IRBM proceeded in a north-easterly direction until reaching Alaskan airspace, where it was intercepted. 30 July 2017 Success FET-01 (Flight Experiment THAAD 01): In FET-01, the Missile Defense Agency (MDA) gathered threat data from a THAAD interceptor in flight. THAAD detected, tracked, and intercepted a medium-range ballistic missile (MRBM), which was launched from a C-17 by parachute. Soldiers from the 11th ADA Brigade conducted launcher, fire control, and radar operations without foreknowledge of the launch time. The MDA director, Lieutenant General Sam Greaves stated: "In addition to successfully intercepting the target, the data collected will allow MDA to enhance the THAAD weapon system, our modeling and simulation capabilities, and our ability to stay ahead of the evolving threat." Lockheed is pushing for funding for the development of an extended-range (ER) version of the THAAD to counter maturing threats posed by hypersonic glide vehicles that adversaries may deploy, namely the Chinese WU-14, to penetrate the gap between low- and high-altitude missile defenses. The company performed static fire trials of a modified THAAD booster in 2006 and continued to fund the project until 2008. The current 14.5 in (37 cm)-diameter single-stage booster design would be expanded to a 21 in (53 cm) first stage for greater range with a second "kick stage" to close the distance to the target and provide improved velocity at burnout and more lateral movement during an engagement. Although the kill vehicle would not need redesign, the ground-based launcher would have only five missiles instead of eight. As of early 2015, THAAD-ER is only an industry concept, but Lockheed believes that the Missile Defense Agency will show interest because of the weapons under development by potential adversaries. If funding for the THAAD-ER begins in 2018, a system could be produced by 2022 to provide an interim capability against a rudimentary hypersonic threat. The Pentagon is researching whether other technologies like directed energy weapons and railguns are better solutions for missile defense; these are expected to become available in the mid to late 2020s. Sometimes called Kinetic Kill technology, the THAAD missile destroys missiles by colliding with them, using hit-to-kill technology, like the MIM-104 Patriot PAC-3 (although the PAC-3 also contains a small explosive warhead). This is unlike the Patriot PAC-2 which carried only an explosive warhead detonated using a proximity fuze. Although the actual figures are classified, THAAD missiles have an estimated range of 125 miles (200 km), and can reach an altitude of 93 miles (150 km). A THAAD battery consists of at least six launcher vehicles, each equipped with eight missiles, with two mobile tactical operations centers (TOCs) and the AN/TPY-2 ground-based radar (GBR); the U.S. Army plans to field at least six THAAD batteries, at a purchase cost of US$800 million per battery. By September 2018 MDA plans to deliver 52 more interceptors to the Army. The THAAD missile is manufactured at a Lockheed Martin facility near Troy, Alabama. The facility performs final integration, assembly and testing of the THAAD missile. The THAAD Radar is an X-Band active electronically scanned array Radar developed and built by Raytheon at its Andover, Massachusetts Integrated Air Defense Facility. The THAAD radar and a variant developed as a forward sensor for ICBM missile defense, the Forward-Based X-Band – Transportable (FBX-T) radar, were assigned a common designator, AN/TPY-2, in late 2006/early 2007. The THAAD radar can interoperate with Aegis and Patriot systems, in a 3-layer antimissile defense. On 28 May 2008, the U.S. Army activated Alpha Battery, 4th Air Defense Artillery Regiment (A-4), 11th Air Defense Artillery Brigade at Fort Bliss, Texas. Battery A-4 is part of the 32nd Army Air & Missile Defense Command. At the time, the battery had 24 THAAD interceptors, three THAAD launchers based on the M1120 HEMTT Load Handling System, a THAAD Fire Control and a THAAD radar. Full fielding began in 2009. On 16 October 2009, the U.S. Army and the Missile Defense Agency activated the second Terminal High Altitude Area Defense Battery, Alpha Battery, 2nd Air Defense Artillery Regiment (A-2), at Fort Bliss. 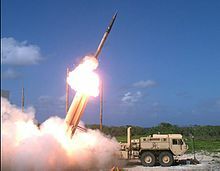 On 15 August 2012, Lockheed received a $150 million contract from the Missile Defense Agency (MDA) to produce THAAD Weapon System launchers and fire control and communications equipment for the U.S. Army. The contract included 12 launchers, two fire control and communications units, and support equipment. The contract provided six launchers for THAAD Battery 5 and an additional three launchers each to Batteries 1 and 2. These deliveries will bring all batteries to the standard six launcher configuration. In May 2017, the Pentagon proposed spending $7.9 billion in its FY 2018 budget on missile defense which includes THAAD interceptors and Patriot interceptors, along with $1.5 billion for Ground-based Midcourse Defense (GMD) against intercontinental ballistic missiles. In June 2009, the United States deployed a THAAD unit to Hawaii, along with the SBX sea-based radar, to defend against a possible North Korean launch targeting the archipelago. In April 2013, the United States declared that Alpha Battery, 4th Air Defense Artillery Regiment (A-4), would be deployed to Guam to defend against a possible North Korean IRBM attack targeting the island. In March 2014, Alpha Battery, 2nd ADA RGT (A-2), did a change of responsibility with A-4 and took over the Defense of Guam Mission. After a successful 12-month deployment by A-4, Delta 2 (D-2) took its place for a 12-month deployment. In 2018-2019 Echo Battery, 4th ADA Regiment (E-3) deployed to Guam. The United Arab Emirates signed a deal to purchase the missile defense system on 25 December 2011. The United Arab Emirates (UAE) has graduated its first two THAAD unit classes at Fort Bliss in 2015 and 2016. Its first live-fire exercises with Patriot missiles took place in 2014. A THAAD interceptor is launched from a THAAD battery during Flight Test Operational (FTO)-02 Event 2a where two air-launched ballistic missile targets were successfully intercepted in November 2015. In March 2019, Bravo Battery, 2nd ADA Regiment (B-2 THAAD), 11th Air Defense Artillery Brigade was deployed at Nevatim Airbase during a joint US-Israeli drill, after which it was to be moved to an undisclosed location in the Negev desert in southern Israel. The X-Band radar system, which is part of the THAAD system, has been deployed at Nevatim since 2008. In 2012, the U.S. AN/TPY-2 early missile warning radar station on Mt. Keren in the Negev desert was the only active foreign military installation in Israel. According to U.S. officials the AN/TPY-2 radar was deployed at Turkey's Kürecik Air Force base. The radar was activated in January 2012. On 1 November 2015, a THAAD system was a key component of Campaign Fierce Sentry Flight Test Operational-02 Event 2 (FTO-02 E2), a complex $230 million missile defense system test event conducted at Wake Island and the surrounding ocean areas. The objective was to test the ability of the Aegis Ballistic Missile Defense and THAAD Weapon Systems to defeat a raid of three near-simultaneous air and missile targets, consisting of one medium-range ballistic missile, one short-range ballistic missile and one cruise missile target. During the test, a THAAD system on Wake Island detected and destroyed a short-range target simulating a short-range ballistic missile:intercepts @1:13 & 3:12 that was launched by parachute ejected from a C-17 transport plane. At the same time, the THAAD system and the USS John Paul Jones guided missile destroyer both launched missiles to intercept a medium-range ballistic missile,:intercepts @2:50 & 3:12 launched by parachute from a second C-17. On 17 October 2013, the South Korean military asked the Pentagon to provide information on the THAAD system concerning prices and capabilities as part of efforts to strengthen defenses against North Korean ballistic missiles. However, South Korean Park Geun-hye administration decided it will develop its own indigenous long-range surface-to-air missile instead of buying the THAAD. South Korean Defense Ministry officials previously requested information on the THAAD, as well as other missile interceptors like the Israeli Arrow 3, with the intention of researching systems for domestic technology development rather than for purchase. Officials did however state that American deployment of the THAAD system would help in countering North Korean missile threats. Later South Korea announced it would be deploying THAAD by the end of 2017. In May 2014, the Pentagon revealed it was studying sites to base THAAD batteries in South Korea. In February 2016, Chinese Foreign Minister Wang Yi expressed concerns that deployment of THAAD in South Korea, despite being directed at North Korea, could jeopardize China's "legitimate national security interests" and in 2017 the Vice Chairman of China's Central Military Commission asserted to the Chairman of the US Joint Chiefs of Staff that deployment of THAAD around China was one of the factors which had a negative influence on "bilateral military ties and mutual trust." The major controversy among Chinese officials is that they believe the purpose of the THAAD system, "which detects and intercepts incoming missiles at high altitudes, is actually to track missiles launched from China" not from North Korea. Chinese experts report that China is focused on the positioning of another THAAD radar system, this one on the Korean peninsula, for gleaning details about China's nuclear weapons delivery systems, such as THAAD's ability to distinguish which missiles might be carrying decoy warheads. Bruce W. Bennett pointed out that China has deployed an S-400 missile system to the Shandong peninsula, between Pyongyang and Beijing, which appears to be a defense against North Korean missiles. 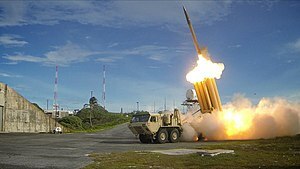 In July 2016, American and South Korean military officials agreed to deploy the THAAD missile defense system in the country to counter North Korea's growing threats and use of ballistic missile and nuclear tests; each THAAD unit consists of six truck-mounted launchers, 48 interceptors, a fire control and communications unit, and an AN/TPY-2 radar. Seongju County in North Gyeongsang Province was chosen as a THAAD site, partly because it is out of range of North Korean rocket artillery along the DMZ. This sparked protests from Seongju County residents, who feared that radiation emitted by the AN/TPY-2 radar would impact their health, and damage the region's famed oriental melon crop. On 30 September 2016, the U.S. and South Korea announced that THAAD would be relocated to Lotte Skyhill Seongju Country Club, farther from the town's main residential areas and higher in elevation, to alleviate concerns. By 25 April 2017, six trailers carrying the THAAD radar, interceptor launchers, communications, and support equipment entered the Seongju site. On 30 April 2017, it was reported that South Korea would bear the cost of the land and facilities for THAAD, while the US will pay for operating it. On 2 May 2017, Moon Sang-gyun, with the South Korean Defense Ministry and Col. Robert Manning III, a spokesman for the U.S. military announced that the THAAD system in Seongju is operational and "has the ability to intercept North Korean missiles and defend South Korea." It was reported that the system will not reach its full operational potential until later this year when additional elements of the system are onsite. On 7 June 2017 President Moon Jae-in suspended further THAAD deployment pending a review, after discovering four addition launchers had entered South Korea without the defense ministry informing him. The 35th Air Defense Artillery Brigade (United States) has integrated THAAD into its layered defense on the Korean Peninsula, denoted Combined Task Force Defender, composed of both US and ROK personnel. Even in the face of a North Korean ICBM test on 4 July 2017, which newly threatens Alaska, a Kodiak, Alaska-based THAAD interceptor test (FTT-18) against a simulated attack by an Intermediate Range Ballistic Missile had long been planned. FTT-18 was successfully completed by Battery A-2 THAAD (Battery A, 2nd Air Defense Artillery Regiment, Terminal High Altitude Area Defense) of the 11th Air Defense Artillery Brigade (United States) on 11 July 2017. The soldiers used the procedures of an actual combat scenario and were not aware of the IRBM's launch time. Also in 2017 another Kodiak launch of a THAAD interceptor was scheduled between 7:30PM and 1:30AM on Saturday 29 July, Sunday 30 July, or Monday 31 July, at alternative times, in preparation for a possible ICBM test by North Korea. On 28 July 2017 North Korea launched a test ICBM capable of reaching Los Angeles. In response, President Moon Jae-in called for deployment of the four remaining THAAD launchers which were put on hold when he came to power. Lee Jong-kul, of South Korean President Moon Jae-in's Democratic Party of Korea states "The nuclear and missile capabilities of North Korea…have been upgraded to pose serious threats; the international cooperation system to keep the North in check has been nullified...", citing tensions over the U.S. deployment of the Terminal High Altitude Area Defense anti-missile system in South Korea. The Atlantic Council, in the June 2017 memorandum "Eliminating the Growing Threat Posed by North Korean Nuclear Weapons" to President Trump, recommends a checklist of actions, including the following declarations to North Korea. No use of WMDs, or it will result in a unified Korea under Seoul after the North's assured destruction. No export of nuclear equipment or fissile material; it will be intercepted, and the US will respond. No missile or missile test aimed at ROK (South Korea), Japan, or the US; it can then be shot down or pre-empted. On 30 July 2017, a Kodiak-sited THAAD interceptor shot down an MRBM which launched over the Pacific Ocean, the 15th successful test; the Missile Defense Agency (MDA) director emphasized the data collection from the intercept, which enhances the modelling and scenario simulation capabilities of the MDA. John Schilling estimates the current accuracy of the North's Hwasong-14 as poor at the mooted ranges which threaten US cities (which would require more testing to prove its accuracy). On 11 August 2017, The New York Times reviewed the anti-missile options that are available to counter a planned salvo of four Hwasong-12 missiles, were they to be launched in mid-August 2017 from the North, and aimed to land just outside the territorial waters of Guam, a distance of 2100 miles, flying at altitudes exceeding 62 miles, in a flight of 1065 seconds. These options for the missile defense of South Korea include "sea-based, Patriots and THAAD" according to General John E. Hyten, commander of U.S. Strategic Command. On 2 September 2017, the North Korean news agency KCNA released a photograph of an elongated payload, intended to fit in the warhead of one of its missiles. On 3 September 2017 both Japan's Foreign Ministry and the South Korean Joint Chiefs announced the detection of a magnitude 6.3 seismic event, centered near Punggye-ri, which is North Korea's underground nuclear test site. Japan's Foreign Ministry has concluded that the event was the North's sixth nuclear test. Choe Sang-hun of the New York Times reports that the test was a major embarrassment for China's president Xi Jinping, who was hosting a BRICS summit (Brazil, Russia, India, China, and South Africa) in Xiamen, China. Cheng Xiaohe, an expert on North Korea at China's Renmin University, said the timing of the test appears to be deliberate. China's Foreign Ministry urged the North to "stop taking wrong actions", and agreed that further UN actions are needed to resolve the impending crisis. By creating a thermonuclear-capable payload for at least one of its missiles, the North has created a need for THAAD, which is capable of intercepting ICBM threats at the lower altitudes and ranges estimated for a Hwasong-14 ICBM subjected to the load of a heavier warhead needed to carry a thermonuclear weapon. On 4 September 2017, BBC analyst Jonathan Marcus predicted a flood of several million refugees at the border of North Korea and China, were the North to be destroyed. China has positioned only two brigades at the border. Marcus points out that China and Russia have proposed the de-nuclearization of Korea and the replacement of the armistice with a peace treaty. On 25 October 2017, Battery D, 2nd Air Defense Artillery Regiment, Terminal High Altitude Area Defense, reflagged with the 35th Air Defense Artillery Brigade in preparation for a permanent change of station to South Korea. In the interim before THAAD D-2's permanent transfer to South Korea with their families, THAAD Battery A-4 will deploy to South Korea. On 30 October 2017, South Korea and China agreed to normalize relations, which had rifted due to THAAD deployment. Korean decision to deploy THAAD to protect itself against North Korea have caused backlash and retaliation measures from China. By March 2016, Army Space and Missile Defense Command was considering THAAD deployments to Europe with EUCOM and the Middle East with CENTCOM. On 27 May 2013, Oman announced a deal for the acquisition of the THAAD air defense system. However, a sale has not been announced. On 6 October 2017, the US has reached a deal to provide Saudi Arabia with THAAD in a deal worth $15 billion. Seven fire units each with a Raytheon AN/TPY-2 radar, two mobile tactical stations (with two spares for a total of 16), and six launchers (with two spares for a total of 44), 360 interceptor missiles. In November 2015, Japanese Defense Minister Gen Nakatani said he would consider the U.S. deploying the THAAD in Japan to counter the threat of North Korean ballistic missiles. By October 2016, Japan was considering procuring either THAAD or Aegis Ashore to add a new missile defense layer. In May 2017 it was reported that Japan government officials now favor the Aegis Ashore system as it comes with a wider coverage area, which would mean fewer units needed to protect Japan, and it is also cheaper. At the Center for a New American Security 2017 conference, citing publicly available sources and simulations of strikes against US bases in Asia, two Navy Fellows, Commanders Shugart and Gonzalez, USN noted that two more Patriot batteries, two more Aegis ships, and five more THAAD batteries would counter China's published SRBM (short-range) and MRBM (medium-range) capabilities against Japan. A Hong Kong–based media report has claimed that THAAD could be deployed in Taiwan to intercept People's Republic of China missiles. However, Taiwan's Foreign Minister, David Lee, has said he is unaware of any talks with the US about possible deployment. Local military experts have said that it was neither necessary, nor affordable for Taiwan to deploy THAAD because China is threatening Taiwan with short-range missiles, whereas THAAD is designed to shoot down medium and long-range missiles. The Minister of National Defense, Feng Shih-kuan, said in March 2017 that he was firmly opposed to the deployment of a THAAD system in Taiwan although comments made by Feng's deputy minister Cheng De-mei during a Foreign Affairs and National Defense Committee Q&A session that was held in April 2017 in which he said that Taiwan did not need a THAAD system in the short term because its US-made phased-array radar system at Hsinchu County’s Leshan base was on par with the THAAD system in terms of detection capability was described as "in slight contrast with Minister of National Defense Feng Shih-kuan’s last month." It was reported that Freddy Lim urged the ministry during the same Q&A session "to procure whatever is necessary to ensure the nation’s defense capabilities, which could not be compromised due to China’s pressure." Taiwan's tracking data from its early warning system, built by the manufacturer of the THAAD radar, can serve to counter China's missile launches. :The cover page shows the coverage of the phased array warning system (PAWS). In response, Chinese military personnel Wang Hongguang have warned that, the day Taiwan start deploying THAAD system will be the time when People's Liberation Army conquered Taiwan. ^ a b c d e f "THAAD". astronautix.com. Retrieved 7 March 2017. ^ Development of a Hit-to-Kill Guidance Algorithm for Kinetic Energy Weapons, 1988. ^ "PACOM Head Supports Exercises Near China, Talks THAAD", Defense News, 25 February 2016. ^ "Naver Dictionary: THAAD", Naver Dictionary. ^ "Pentagon To Accelerate THAAD Deployment" Archived 10 February 2009 at the Wayback Machine, Jeremy Singer, Space News, 4 September 2006. ^ "Lockheed Martin completes delivery of all components of 1st THAAD battery to U.S. Army".Yourdefencenews.com, 8 March 2012. ^ a b "Envisioning the Army of the Future, 1998-2001". United States Army Research Laboratory. 1 March 2011. Retrieved 17 August 2018. ^ "Army Research Laboratory. 1999 Annual Review". Army Research Laboratory. January 1999 – via Defense Technical Information Center. ^ "With an Eye on Pyongyang, U.S. Sending Missile Defenses to Guam". The Wall Street Journal, 3 April 2013. ^ Atkinson, James W. (13 August 1996). "The Theater High Altitude Area Defense program: an interim examination of its acquisition strategy". Monterey, California: Naval Postgraduate School;Springfield, Va.: Available from National Technical Information Service – via Internet Archive. ^ a b THAAD Demonstration-Validation program. ^ Successful THAAD Interceptor Launch Achieved Archived 3 September 2006 at the Wayback Machine, 22 November 2005. ^ Successful THAAD Integrated System Flight Test Archived 18 June 2006 at the Wayback Machine, 11 May 2006. ^ Successful THAAD Intercept Flight Archived 20 July 2006 at the Wayback Machine, 12 July 2006. ^ Successful THAAD "High Endo-Atmospheric" Intercept Test Archived 30 September 2007 at the Wayback Machine, 27 January 2007. ^ "MDA's new THAAD success" Archived 9 April 2007 at the Wayback Machine, Martin Sieff, UPI, 6 April 2007. ^ "Army, Navy and Air Force shoot down test missile", Tom Finnegan, Honolulu Star-Bulletin, 6 April 2007. ^ "Press Release by Lockheed Martin on Newswires". Texas: Prnewswire.com. 26 October 2007. Archived from the original on 10 February 2009. Retrieved 24 January 2011. ^ "31st successful 'hit to kill' intercept in 39 tests". Frontierindia.net. 27 October 2007. Archived from the original on 30 October 2007. Retrieved 24 January 2011. ^ "THAAD shoots down missile from C-17". The Associated Press, 27 June 2008. ^ Defense Test Conducted[permanent dead link] MDA, 27 September 2008. ^ "Terminal High Altitude Area Defense". MDA. 17 March 2009. Archived from the original on 26 March 2009. ^ "Officials investigating cause of missile failure". The Garden Island. 12 December 2009. ^ "THAAD System Intercepts Target in Successful Missile Defense Flight Test". MDA. 29 June 2010. Archived from the original on 11 August 2011. ^ "THAAD Weapon System Achieves Intercept of Two Targets at Pacific Missile Range Facility". Lockheed Martin. 5 October 2011. Archived from the original on 9 December 2011. ^ "FTI-01 Mission Data Sheet" (PDF). Missile Defense Agency. 15 October 2012. Archived from the original (PDF) on 30 October 2012. ^ a b "Ballistic Missile Defense System Engages Five Targets Simultaneously During Largest Missile Defense Flight Test in History". Missile Defense Agency. 25 October 2012. Archived from the original on 16 February 2013. ^ Butler, Amy (5 November 2012). "Pentagon Begins To Tackle Air Defense 'Raid' Threat". Aviation Week & Space Technology. Archived from the original on 27 March 2013. ^ US to test THAAD missile defense system: Report. ^ a b U.S. THAAD missile defenses hit test target as North Korea tension rises. ^ "US successfully tests THAAD amid North Korean missile tensions". Foxnews.com, 11 July 2017. ^ a b FTT-18 THAAD Flight Test Video (July 11, 2017) 2:25 minute clip. ^ FET-01 (30 July 2017) video clip. ^ (3 August 2017) 11th ADA THAAD intercepts test target, again. ^ MDA Test record, 2016. ^ a b "China's Hypersonic Ambitions Prompt Thaad-ER Push". Aviationweek.com, 8 January 2015. ^ "Thaad-ER In Search Of A Mission". Aviationweek.com, 20 January 2015. ^ "U.S. military deploys advanced defensive missile system to South Korea, citing North Korean threat". ^ a b Stewart, Phil. "Exclusive: U.S. plans to test THAAD missile defenses as North Korea..."
^ "Raytheon: Army Navy/Transportable Radar Surveillance (AN/TPY-2)". Raytheon Corporate. ^ a b De Leon Petta Gomes da Costa (16 March 2016). "Chinese Geopolitics: Space Program Cooperation among China, Brazil, and Russia". Astropolitics: The International Journal of Space Politics & Policy. 14 (1): 90–98. Bibcode:2016AstPo..14...90D. doi:10.1080/14777622.2016.1148465. ISSN 1477-7622. OCLC 300873391. ^ "Second Battery of Lockheed Martin's THAAD Weapon System Activated at Fort Bliss", Reuters (10-16-2009). Retrieved 20 October 2009. ^ Gienger, Viola (18 June 2009). "Gates Orders Measures Against North Korea Missile (Update2)". Bloomberg. Retrieved 24 January 2011. ^ "US to move missiles to Guam after North Korea threats". BBC. 3 April 2013. Retrieved 3 April 2013. ^ Burge, David (9 April 2013). "100 bound for Guam: Fort Bliss THAAD unit readies for historic mission". El Paso Times. Archived from the original on 29 June 2013. Retrieved 12 April 2013. ^ Hana Levi Julian, US Army Deploys THAAD, Most Advanced Aerial Defense System, in Southern Israel, JewishPress.com, 4 March 2019. ^ Amos Harel, Yaniv Kubovich and Noa Landau, In First, U.S. Deploys THAAD Missile Defense System in Israel in Joint Drill, Haaretz, 4 March 2019. ^ "How a U.S. Radar Station in the Negev Affects a Potential Israel-Iran Clash." Time Magazine, 30 May 2012. ^ a b c "2015 THAAD FTO2 Event2a". Retrieved 14 July 2016. ^ "USS John Paul Jones participates in ballistic missile defense test", Ho'okele – Pearl Harbor – Hickam News, 6 November 2015. ^ "U.S. completes complex test of layered missile defense system", Reuters, Anfrea Shalal, 1 November 2015. ^ 'S.Korea Requested Information on THAAD to Develop L-SAM' – KBS.co.kr, 5 June 2014. ^ "Seoul vows to proceed with THAAD deployment, slams China's 'reprisals' tactics". rt.com. 6 January 2017. Retrieved 1 April 2018. ^ "United States Army has a plan to deploy THAAD air defense missile systems in South Korea". Armyrecognition.com, 29 May 2014. ^ Shala & Stewart, Andrea & Phil (25 February 2016). "China cites concerns on U.S. missile defense system in South Korea". Reuters. Reuters. ^ Editorial, Reuters. "China military criticizes 'wrong' U.S. moves on Taiwan, South China..."
^ Perez, Jane. "For China, a Missile Defense System in South Korea Spells a Failed Courtship". New York Times. New York Times. Retrieved 26 September 2016. ^ Li Bin "The Security Dilemma and THAAD Deployment in the ROK". chinausfocus.com, 6 Mar 2017. ^ THAAD Radiation Fears Spark South Korean Protests Voice of America 15 July 2016. ^ "THAAD's new home will be golf course in South Korean mountains". STARS AND STRIPES. 30 September 2016. ^ "Seongju residents vow to fight against THAAD". Korea Times. 13 July 2016. Retrieved 18 September 2018. ^ a b Osan AirBase (6 March 2017). "THAAD Deploys to Republic of Korea". Retrieved 7 March 2017. ^ Mullany, Gerry (6 March 2017). "U.S. Starts Deploying Thaad Antimissile System in South Korea, After North's Tests". The New York Times. ISSN 0362-4331. Retrieved 7 March 2017. ^ Pearson, James (8 March 2017). "Even with THAAD defense, North Korea missile barrage poses threat to South". Reuters. ^ "Analysis - Why China is so mad about THAAD, a missile defense system aimed at deterring North Korea". ^ Anna Fifield (25 April 2017) "U.S. military starts installing controversial anti-missile battery in South Korea". Washington Post. Retrieved: 2017-04-26. ^ Blanchard, Ben. "China urges all sides in North Korea standoff to 'stop irritating'..."
^ Associated Press (30 April 2017). "The Latest: US won't seek South Korean money for THAAD" Fox News. Retrieved: 2017-04-30. ^ "U.S. Antimissile System Goes Live in South Korea". New York Times, 2 May 2017. ^ "US anti-missile system operational in South Korea". BBC, 2 May 2017. ^ Maresca, Thomas (7 June 2017). "South Korean President Moon Jae-in suspends further THAAD deployment". USA TODAY. Retrieved 11 September 2017. ^ Chandran, Nyshka (26 July 2017). "North Korea is more erratic than ever, but South Korea is in no rush for US missile defense". CNBC News. Retrieved 11 September 2017. ^ "35th ADA BDE welcomes new commander". ^ a b c "THAAD battery reflags to align with 35th ADA Brigade in South Korea". ^ CNN, Barbara Starr and Zachary Cohen. "US to test THAAD missile defense system". ^ CNN, Madison Park. "Coast Guard gives notice: Missile launch expected in Alaska". ^ Burton, John. (26 July 2017) "Moon's nuclear option" The Korea Times (a sister publication of Hankook Ilbo 한국일보)] Quote: Absent a North Korean response to the request for de-nuclearization talks, South Korea has mooted its nuclear options: "If North Korea continues to conduct nuclear weapon and missile tests while the North Korean nuclear negotiations are sluggish, South Korea should decide whether to break the principle of denuclearization and start developing nuclear weapons," —Lee Jong-kul. ^ Lynch, Sarah N. "U.S. THAAD missile hits test target amid growing pressure from..."
^ a b c "What is True and Not True About North Korea's Hwasong-14 ICBM: A Technical Evaluation - 38 North: Informed Analysis of North Korea". 10 July 2017. ^ Ali, Idrees. "North Korea can hit most of United States: U.S. officials". ^ Broad, William J.; Sanger, David E. (31 July 2017). "Success of North Korean Missile Test Is Thrown Into Question" – via NYTimes.com. ^ "Video Casts Doubt on North Korea's Ability to Field an ICBM Re-entry Vehicle - 38 North: Informed Analysis of North Korea". 31 July 2017. ^ Kim, Christine. "North Korea will develop Guam strike plan by mid-August: KCNA". ^ Mason, Jeff. "Trump says U.S. not 'putting up with' North Korea's actions". ^ "Here Are The Facts About North Korea's Nuclear Test". ^ Jeffrey Lewis (13 September 2017) SAR image of Punggye-ri Note especially the 'before and after' comparison of Mount Mantap, a subsidence of several meters spread over 85 acres, in the grey-scale gif which superimposed images of 26 August and 6 September 2017. ^ CNN, Joshua Berlinger and Taehoon Lee. "Nuclear test conducted by North Korea, country claims". ^ Sanger, David E.; Sang-Hun, Choe (2 September 2017). "North Korean Nuclear Test Draws U.S. Warning of 'Massive Military Response'" – via NYTimes.com. ^ CNN, Lauren Said-Moorhouse. "Nuclear test in North Korea: Live updates". ^ Oliphant, James. "Trump: 'Sad day' for North Korea if U.S. takes military action". ^ "North Korea says it tested hydrogen bomb that can fit in intercontinental missile". ^ Kim, Christine. "China, South Korea agree to mend ties after THAAD standoff". ^ Judson, Jen (7 December 2017). "Poland has sticker shock over 'unacceptable' price tag for Patriot buy". ^ "Statement Opposing U.S. THAAD 'Missile Defense' System Deployment in South Korea". www.veteransforpeace.org. ^ Lee, Jenny. "THAAD Cost Debate Could Erode US-South Korea Alliance, Experts Say". ^ Diplomat, Jin Kai, The. "The Other Reasons China Wants to Block THAAD Deployment". ^ Mody, Seema (28 April 2017). "China lashes out as South Korea puts an American anti-missile system in place". ^ "China, Russia vow to deploy measures against US missiles in South Korea". 13 January 2017. ^ "Saudi THAAD sale approved - Jane's 360". www.janes.com. ^ "Japan favors Aegis Ashore over THAAD to boost missile defense: sources". Reuters. 13 May 2017. Retrieved 9 August 2017. ^ "МИД РФ выразил опасения в связи с возможным контролем США над ПРО в Японии". 15 January 2018. ^ "THAAD may be deployed in Taiwan". HK media. Retrieved 9 March 2017. ^ "Could Taiwan be up next in THAAD trouble?". ^ a b "Taiwan would welcome F-35 jet sales: ministry". Taipei Times, 6 April 2017. ^ "PAVE PAWS Radar System". ^ "A Dossier on the Pave Paws Radar Installation on Leshan, Taiwan" (PDF). Wikimedia Commons has media related to Terminal High Altitude Area Defense.